Want to spruce up your desktop and at the same time impress your friends? 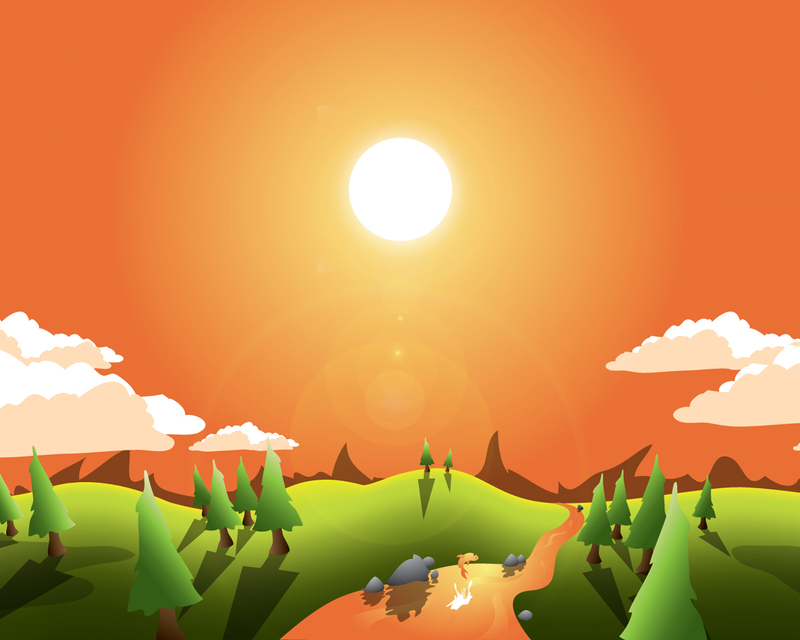 Why not create a vector landscape wallpaper? In this simple tutorial, you will learn how to create an eye-appealing wallpaper quickly and effectively. Let's get to it! To begin your wallpaper, create a new document in Illustrator (Command + N). I have a wide screen monitor and so I enjoy 1680 pixels by 1050 pixels. Since you're creating this in vector, your artwork will be able to be resized to any resolution. It is better to create wide screen artwork because you can always crop the sides off in 4:3 aspect ratio resolutions. Use the Rectangle Tool (M) and create your land. Make it a nice green or refraction from the sky color of your choice. To create the foreground rolling hills use the Warp Tool (Shift + R) and, having the rectangle selected, click and drag to raise the horizon line. Use the Mesh Tool (U) to click on your landscape and create rows growing further apart as they reach the foreground. This will simulate distance. I created six rows. Row 1 is the horizon line and row 6 is the foreground. Use the Direct Selection Tool (A), hold shift, and select each point along the row 1. Once you have selected all the points along row 1, open up your Color window (F6) and brighten up the color on these points. I chose C=9%, M=0%, Y=95%, and K=0%. Now continue this step with each row going all the way down to row 6. For each row I darkened the K channel as follows: row 2 at 0%, row 3 at 25%, row 4 at 72%, row 5 at 88%, and row 6 at 100%. I did this in each channel to give us black. Make sure you do this to each point along the row in the gradient mesh. To create the sky place a rectangle behind the horizon and apply a nice radial gradient to it. I like sunsets so I used orange. Use whatever type of lighting you desire. Violet and purple make for a great twilight. Now lets create the sun. Grab the Ellipse Tool (L). Create a circle in the middle of the gradient that you created in the previous step. Select the circle and then click Filter > Stylize > Outer Glow. Apply a nice screen to it with a blur. You can add an additional outer glows to it as well if you want it to pop even more. Also, try applying a Hard light or Overlay Mode to your Outer Glow. To draw the mountains in the background use the Paint Brush Tool (B) and loosely sketch an abstract mountain range. Make the fill a dark green and change the Transparency to Multiply and the Opacity to 50%. Also, make sure the mountains are behind the foreground hills and in front of the orange sky. Now to create some clouds. Use the Paint Brush Tool again and sketch some a clouds. If you hold the Alt key when you reach the point you started drawing from, it will join the end point with the start point. Now, with the outlined cloud selected, press Shift + X. This will invert your stroke color to your fill color and vice versa. Make sure you have a white selected when drawing your cloud. Select your single cloud, hold Alt, and then drag your cloud shape to duplicate. Do this four times. Bring two of the clouds in front of the other two and change the coloring of the front clouds to an off white that compliments the color of the sky (Clouds 3 and 4 are complimenting the sky). Also, to mix things up and create a more organic feel, select the 2nd white cloud, right click on it, and Transform > Reflect it 90 degrees vertical. Also, you can shrink clouds 2 and 4 a bit by using the Scale Tool (S) and dragging them smaller. Group this cluster of clouds you have just created by selected them all and pressing Command + G. Now hold Alt and drag this grouped cluster to the other points in the sky. Do this until you are happy with the amount of precipitation. Shrink a couple of the clusters and reflect them as well to simulate clouds in the distance. Let's draw some trees. Use your Paint Brush Tool again to draw a quick tree trunk and some green pine separately. Throw a brown gradient on the trunk and a green gradient similar to the hills on the pine. Drag the green over the trunk and group the two objects together (Command + G). You can spruce up your pine tree by drawing more details if you desire. Maybe an owl or a dead tree with no needles. Use your imagination. Once you have your prototype tree grouped, select it, hold Alt, and spread the trees out sporadically over the landscape. Use the Transform > Reflect option on some of the trees so they don't all look cookie cutter. Also, scale some of them down as they appear further towards the horizon. Rotate the trees slightly at the base of the trunk by selecting the tree, grabbing the Rotate Tool (R) and clicking on the base of the trunk. Rotate the trees that are closer to the edges of your artboard to simulate a panoramic lens. With the Gradient Tool (G) apply a gradient to each tree in the direction that the light is hitting it. The lighter gradient is on the side the sun is hitting. Draw a river going off into the horizon with the Paint Brush Tool. Then apply the same gradient that you used in the sky. You can do this by using the Eyedropper Tool (I). With the river selected, press I and then click on the sky. Draw some rocks along the river and apply a radial white to black gradient on each one separately. This will give them a nice gray. Make sure you consider the lighting on these objects as you did with the trees. Now, lets get into the shading of our scene. To do this grab your Paint Brush Tool again, select black, and draw some loose and flowing shapes below the rocks. This will be the shadow of the rocks cast into the river. They are squiggly because the river is fluid and distorts the shadow and reflection of the rocks. Send the shadow layer behind the rocks (press Command + Left or Right Bracket keys to move the shadow behind or in front of other objects). Then in the Transparency window (Command + Shift + F10), set it's Mode to Multiply and it's Opacity to 50%. Using the lighting principles in Step 14 and 17, Paint the shadows cast by the trees in the scene. I find that shading really brings life and depth to the landscape. Now draw the shadow cast by the rolling clouds. I made the shadow from the cloud 25% Opacity instead of 50%. Next, paint some swirl flowing lines in your stream. color them with the same gradient you used on the river. And try to match each flowing shape to the gradient in the area of the stream that it is in. For example, the swirl furthest in the horizon contains more dark orange than yellow. Last of all, paint some wildlife. I enjoy a good salmon every now and then so I painted one jumping in the river. You can combine some pretty simple shapes to create a pretty sweet salmon (see below). I also painted some splashing from where the fish jumped. Now, open Photoshop and create a new document. My desktop resolution is 1680 pixels by 1050 pixels, so I created a new document that size at 300 pixels/inch. Once you have done that, open Illustrator again, drag your mouse over all the objects in your landscape, press Command + C to copy. After you have copied your landscape, open your new document in Photoshop and press Command + V to paste your vector into Photoshop. Select Smart Object and press OK. Now your illustration will appear in your document. Holding Shift + Alt, drag one of the four corners of the Smart Object out until it fits perfectly in your artboard. You can also move the Smart Object around by holding your left mouse inside of the Smart Object and dragging. Once you have a good position, press Enter. Smart Objects are great because you can scale it up or down without loosing any quality. Create a new layer by hitting the Paper Icon in the Layers Window or pressing the hot key Command + Shift + Alt + N. Fill that layer with 50% gray (Thats 50% B on the HSB scale). Next apply the infamous Lens Flare. I know that the Lens Flare is hated because of its over use, but this is a great time to use the Lens Flare correctly. Select your new "gray" layer and click Filter > Render > Lens Flare. Set your Lens Flare in the center upper half of the layer by clicking on the spot where the sun would be. Set the Brightness to 75% and click OK. Now set that layer's blend mode to Overlay. You should have a really cool Lens Flare from your sun. Now all you have to do is save it as a jpg. Click File > Save As and select the Format JPEG. 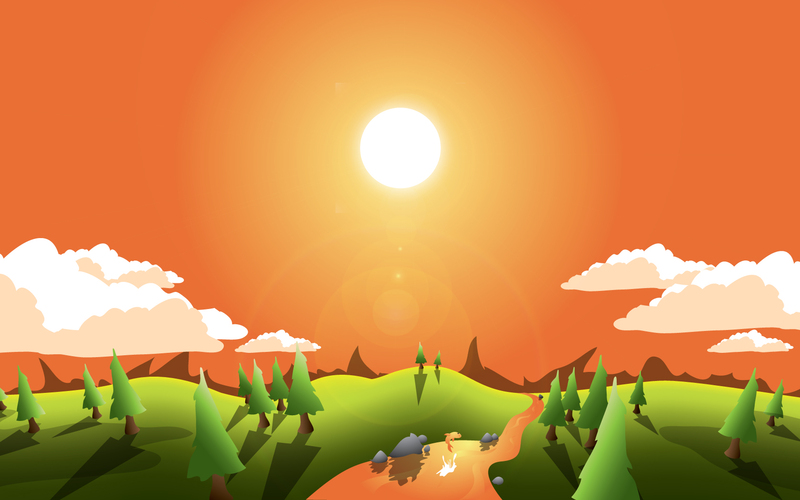 Bump the Quality to 12 and press OK. Now you've made a sweet vector landscape for your desktop. If you want to make different resolutions other than 1680 pixels by 1050 pixels, all you need to do is open up the PSD of your landscape in Photoshop and click Image > Canvas Size and change your pixels to 800px by 600px, 1024px by 768px, 1280px by 1024px, etc. Just make sure you have the measurements set to pixels and not percent, inches, or centimeters. Note, you will lose some of the edges if you change the canvas size to a 4:3 aspect ratio. There you have it! A quick and simple landscape desktop. You can really play around with this and do a lot of different types of landscapes. I hope you've enjoyed this tutorial. The final image is below. You can view the 1680px by 1050px version here and the 1280px by 1024px here. Illustration and graphic design are two of Brent Nelson's favorite things. His favorite color is green and he enjoys long walks along the Vedder River. He inherited the habit of doodling from his father and has thus pursued a career as a graphic designer. He lives happily with his beautiful wife in Chilliwack, BC, Canada and is currently taking freelance/contract opportunities.